You will be downloading a file named "Robe Soleil Ellowyne.zip". I look forward to hearing what you think of my pattern! Please Note: I am truly happy that my patterns help others make a little extra "dolly funds" (or even a nice second income), that's what they're for! It's just that in these days of universal search engines and google rankings, small designer credits DO add up and help bring new customers to my website for new pattern sales. Copyright Terms For Products Made From My Patterns: Products made from MHD Designs patterns are intended for personal use (for fun), or small scale personal and business profit as long as you credit us with the design. 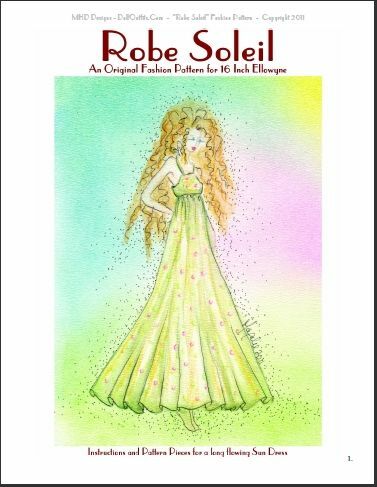 This means that if you sew doll clothing based on one of my patterns and offer it for sale, you are required to clearly state "This ensemble is based on a fashion pattern from MHD Designs" somewhere in the text of your web page or eBay listing. This is required even if you modify the pattern from its original design. All patterns and designs © 2006-2010 MHD Designs by Magalie Houle Dawson. All rights reserved, including downloading, mass producing, photocopying, enlargements, reductions, all other forms of reproduction, web site sharing, Email, or any other means of redistribution. Commercial selling or reselling of my patterns by any means, including eBay or any other web site is forbidden except by written permission only. Small to large scale commercial use (i.e. mass production) of clothing made from these patterns, or clothing offered with (included with) your own mass produced or limited edition line of dolls, and all other forms of small to large scale commercial production is forbidden except by written permission. Click HERE to view more MHD Doll Patterns!